Introducing AMD’s most advanced APU technology. 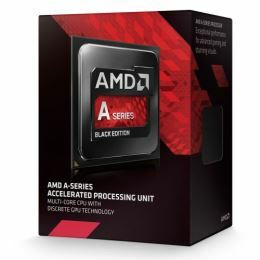 The AMD A10-7870K challenges the very definition of a processor with 12 Compute Cores (4 CPU + 8 GPU)* and innovative Graphics Core Next (GCN) architecture. Immerse yourself in leading-edge graphics technology with Graphics Core Next (GCN) architecture from AMD. This third-generation technology unlocks advanced features and the stunning performance of AMD Radeon™ graphics. The new AMD A-Series APUs support the latest graphics APIs to bring next generation games to life. With support for these latest technologies in the latest AMD APUs, you can game at unprecedented levels of performance, with impressive effects and details. AMD TrueAudio technology provides 32-channel surround audio to make games sound better and deliver more accurate voice recognition. Experience a whole new level of immersion. Revolutionary Heterogeneous System Architecture (HSA) is a new standard in processor design where the CPU and GPU work together in harmony. With HSA, the full potential of AMD hardware enables more efficient performance, so applications are fast and responsive.